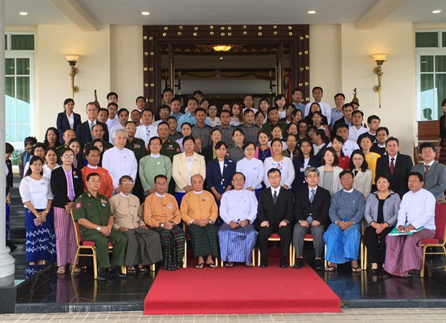 Part 1 of the seminar was attended by 80participants from Myanmar, including the Minister of State for Foreign Affairs, 6 members of Parliament, Director General of the Department of Atomic Energy, director-level officials from the Ministry of Foreign Affairs, President Office, Ministry of Industry, Ministry of Natural Resources and Environmental Conservation and senior military and law enforcement officers. The session emphasized the importance of nuclear nonproliferation, especially that of the entry into force of the Additional Protocol, in order to raise awareness of the issue among the participants. Participants from Japan and the United States were: Deputy Director-General and an official from the Disarmament, Non-Proliferation and Science Department of MOFA; Director and Assistant Director of the Security Export Control Policy Division of METI; Deputy Director and 4 officials from ISCN; and 3 officials from U.S. DOE’s National Nuclear Security Administration and National Laboratories. Part 2 of the seminar received approximately 30 officials who are in charge of nuclear energy, radiation use, industry, natural resources, and export control. 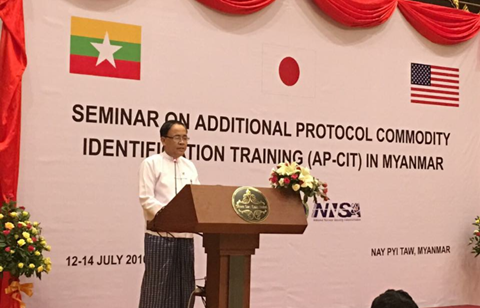 Various speakers discussed AP procedures and reporting, nuclear technologies itemized in AP’s Appendix II, and the importance of export control including dual-use items, helping to strengthen export control and facilitating the entry into force of AP in Myanmar. For more information on this training please visit the DAE website. Photos courtesy of the Myanmar DAE.